A few years ago Groundspeak Inc, the company which runs the www.geocaching.com website, declared that the third Saturday in August each year would be International Geocaching Day. This meant that last Saturday was International Geocaching Day for 2014 (IGD2014), so of course we celebrated by going caching. 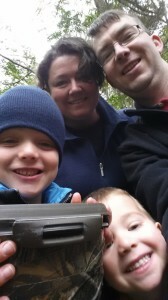 The rain was forecast to arrive during the day, so we’d planned to get a few caches before the rain started. Well, the rain didn’t arrive until much later then we’d expected, so our caching day lasted longer than we’d thought it would. We managed to find seven caches, representing four different types (traditional, multi, EarthCache, and letterbox hybrid). Along the way we earned six souvenirs from Groundspeak (one for IGD2014, and five as part of the 7 Souvenirs of August promotion that Groundspeak set up this year). We’d earned a couple of souvenirs earlier in the month, but managed to complete the set on Saturday – rather fitting for IGD2014, we thought. The boys were able to help us with some counting for the multi-cache that we did, and Tom did the maths to work out the coordinates of the final location. It’s nice that the boys are older and can get a bit more involved in the experience, rather than just getting pushed in the pram or waiting in the car. After finding one cache on Sunday we’re now up to 350 finds, and slowly closing in our goal of 400 finds by the end of the year. I’ve taking some Long Service Leave in September and October which includes the school holidays, so hopefully we can do a couple of big caching days then, and maybe even reach 500 finds!